Relate: Did you ever notice that there seems to be a bunch of places called Antioch in the book of Acts? If not, you should read your Bible more. If you have… there’s a reason for that. After Alexander the Great passed away, his empire was divided into four parts and the part that included most of Turkey and the Mesopotanian basin became the domain of Seleucus Nicator. Nicator followed the example of Alexander in founding or renaming cities everywhere his foot tread. Unlike Alex, he chose to name these cities after his father Antiochos rather than himself. In all, sixteen cities were given this name. It wasn’t just cities that Nicator named after his dad. The Emperor’s firstborn son also inherited the name (as well as the Empire) and it was this second king of the Seleucid Empire who was most influential in shaping Antioch of Pisidia into what it would have been when Paul and Barnabas made it a major stop in their first missionary journey (which began in Antioch of Syria). This Antioch fortified Antioch against the incursions of the Galatians who were constantly invading during his rule. He made Antioch a major center protecting the border between the areas that would eventually become Pisidia and Phyrgia under Roman rule. This ruler Antioch should not be confused with the Antioch commonly referred to by Biblical scholars. That Antioch (Epiphanes) was actually the fourth to carry the name in this dynasty. It was Antioch Epiphanes who fulfilled the prophesy in Daniel of the abomination of desolation. Antiochus Epiphanes basically means “god in the flesh” or “god made manifest” and he had the ego to try and live up to that name. When you think of, the Antiochs did. Epiphanes followed Antioch the Great who followed Antioch Theos (“Antioch of god” or “the god Antioch”) who followed the Antioch the First who is more commonly known as Antioch Soter (Antioh the Savior) for “saving” the Seleucid Empire from the Galatian “barbarians”. Before it is all said and done, there would be thirteen men named Antioch ruling the Seleucid Empire that contained sixteen urban centers also called Antioch. My thoughts are that the only reason they stopped there was because the Empire itself didn’t outlast that last, thirteenth, unlucky Antioch by a year. By this time the Romans put an end to the Seleucids and their multiplicity of Antiochs so that the way might be paved for the followers of the Way to make their way from one Antioch to the next with the message of the One Soter (Savior) who truly was Theos (God) Epiphanes (Manifest). 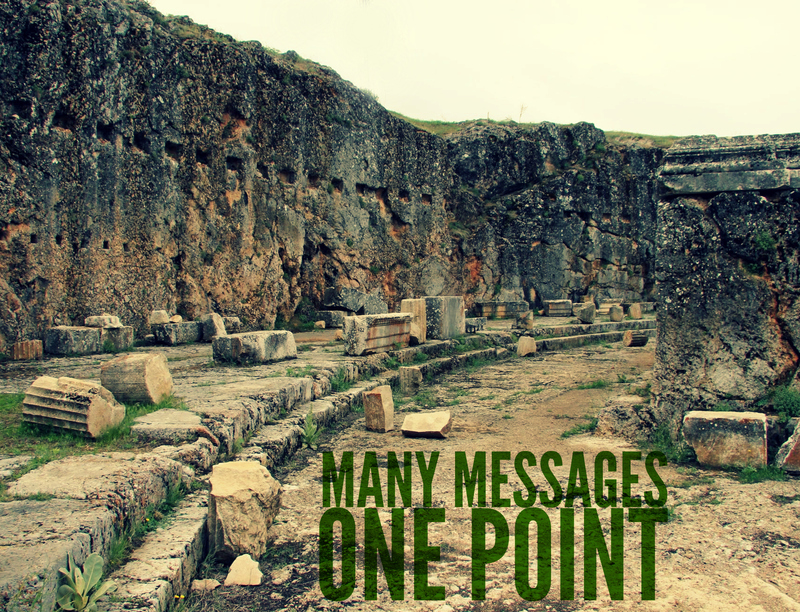 React: Everywhere that Paul preached, he would share a message that would be both relevant and specific to his audience in one way or another. In city after city he would make connections that would be relevant and easily understood and this message in Acts 13 fits that same agenda. He preached of the founding of a nation, the raising up of a king followed by a greater king whose descendant would ultimately be the Soter, but not just the Savior of one kingdom but rather of the whole world. I can almost imagine him pointing to the fortifications around him built by Antiochus Soter as he preached about Jesus the Soter. The thing is, no matter where one of Paul’s sermon’s begins, it always has one very specific destination. No matter what illustrations are used, the application is always the same. “Through Jesus there is forgiveness for your sins.” Down through the years, millions of sermons have been preached but each and every one that was not a waste of breath and time ultimately ended, and continues to end at this point: Through Jesus and through Him alone, there is still forgiveness for our sins. God, You alone have provided exactly what I need. You are Jesus Theos, Jesus Ephiphanes, Jesus Soter. You are God, manifest, my Savior. I pray that You would help me constantly and consistently find my way back to Your cross. Because You alone have saved me, to You alone do I surrender and offer up my fealty. You alone are my Savior King. Praise Daddy-God and His son Jesus Christ! And Daddy-God’s Holy Spirit! Without this ultimate saving and the wisdom HS gave Paul…I would have no hope! That’s the amazing thing about the truth: in the mind of those that wield it, every step humanity takes becomes evidently an attempt to attain the Ultimate Truth: that power is strongest when it serves, and that only love endures. Great post!
. How did God lead you to Istanbul? Thanks BJ, have a blessed day! I am learning so much by reading your blog. Thank you for your posts, they are always insightful and help me to gain a deeper understanding. Keep up the good work! Amen Hallelujah God Bless you friend. I thank God for you, for this amazing read. This is a good write-up, God bless you ! In my home Country as well as in other Western countries there has been a turning away from Christian beliefs. Getting People to hear and heed our message is more difficult because of that. You point out how Paul was alluding to the situation his listeners were in and to the heathen surroundings. An interesting and instructive post. Then you point to the centre of the Christian message that we can recieve forgiveness of our sins through Jesus Christ. I like this post!